Welcome to the Fantasy Glassworks Beer Mugs, Pints and Pilsners shop! We have a wide selection of personalized beer mugs, pints, pilsners and glasses (not the same two or three glasses repeated over and over) that you can customize however you'd like. Each engraved glass below is different. We have many font and stock design choices and specialize in custom logos and artwork. You can even send us your hand-drawn artwork! If you don’t see the font or design you’re looking for just send us an email – we can find it for you. 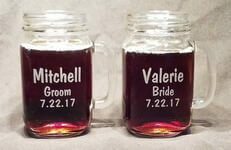 Whether you’re looking for the perfect engraved groomsman or bridesmaid gifts (women like beer too! ), a unique birthday gift, your own custom logo on a mug, a personalized gift for the home brewer or crafter, corporate events, to fill out your home bar or any other occasion you can think of, we can make your idea a reality. Our production time is only two to three business days. We don't charge for production Rush service, let us know if you're short on time and we'll do our best to get your order out sooner (does not affect shipping time). If you have any questions, please feel free to call or email! There's more to a personalized beer mug than just the glass itself; it can help make a toast, a new memory and even new friends! 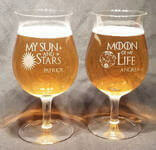 Now you can take that same old beer mug and completely custom engrave it, making it special. There's nothing quite like hearing the clinking of beer mugs together amongst laughter of friends and family. The only thing that might be better is having the confidence in your newly custom beer mug when you give a hearty "Salute" or "Cheers" with a few your closest friends. Now, that you've imagined the fun and memories you can make with one of our custom beer mugs, you've got to decide which of our personalized beer mugs fits your beer drinking style. Our Custom Beer Mugs, Pilsners and Pint Glasses are great gifts for groomsmen, bridesmaids, weddings, birthdays, corporate events or just for your own home bar. While we have many stock designs available, we can also use your custom design or company logo, and we can find just about any design you might want. Price includes free text engraving on one side. Many other engraving options are available for a small additional fee. Over 170 different glasses. Dozens of fonts. Many stock designs. Custom logos, designs or artwork. No set-up fees. No minimum orders. Rush service is no charge, just let us know. Fast service. Best customer service on the web. Family owned with 3 generations and counting! Military customers receive a 10% discount with a valid .mil email address. Discount will be applied before we start your order.